Mini-9/11 in Benghazi: Why the Americans are so adept at turning friends into foes? Killing of US Ambassador in Libya is not only a condemnable act, it is sad and gory. An ambassador is supposed to be the most protected precious asset in the host country even when the two countries are at war with each other. And Libya and the US won friendship the hard and bloody way. The present dispensation in Benghazi was installed after a civil war, aided and funded by the US, to rid the Libyans of atrocious rule of Col Qadhafi. The Libyans, both people and their government, should have been grateful to the US. But this event of killing of US ambassador indicates that Americans have such an incredible quality of turning friends into foes in the blink of an eye. This has happened in many countries and this is still happening in Afghanistan where we see a dangerous shift from blue-on-green to green-on-blue. According to reports, in response to the attack on the US consulate building in Libya on Tuesday night, now widely considered to have been planned by al-Qaeda, the Obama administration has ordered drones to fly over the country, additional US Marines to guard diplomatic buildings, and warships to the Libyan coast. The administration on Wednesday announced sending drones to fly over Benghazi and other locations in eastern Libya in search of jihadi encampments that may have been involved in the attack, which killed four Americans. The fact that additional US Marines and warships, which carry Tomahawk missiles, have been included in the reaction could spell airstrikes in the near future. These policies, as well as an extensive FBI investigation into the incident, appear to be the beginnings of what CBS News called “a terrorist hunt in Libya, as evidence mounts assault was perpetrated by al-Qaeda affiliates in Libya. Whether it was spontaneous or planned, it was not an isolated incident. There were protests against US embassies across the Middle East, with demonstrators rallying against a new anti-Muslim film that seems to have come out of nowhere, fanning religious hostilities. 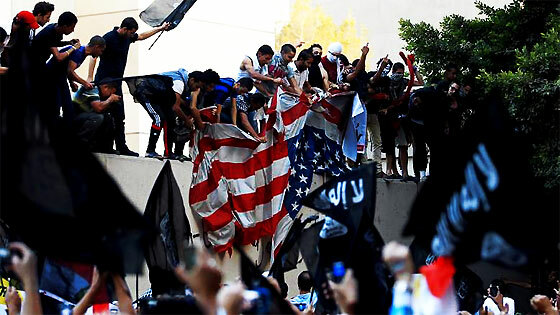 Several embassies across the region warned of possible protests and by extension possible attacks, with fear growing in the wake of an attack on the Benghazi Consulate. Protests continued in Egypt, another country liberated by the US from the clutches of Hosni Mubarak when protesters climbed the embassy facade and spray-painted graffiti on the walls. Police attacked protesters, wounding dozens and eventually forcing the protesters away from the embassy. Who is Sam Bacile? So far, the answer depends on who you ask and what you read. Early reports after Tuesday’s violence against American diplomatic posts in Egypt and Libya identified Bacile as the producer and director of an absurd anti-Muslim film blamed for inspiring the anger of the mobs. But according to reports, his biography remains sketchy at best. He has claimed to be a real estate developer, but nobody with his name has a real-estate license or appears in corporation records in California. He has been described as Israeli, but Israeli officials have not confirmed or denied that he is a citizen. He has also claimed to have raised millions for his film, but the results, a low-budget, offensive mess, seem to speak for themselves. What is known is that in the first two days of July, someone with the YouTube username “Sam Bacile” uploaded two similar previews for a supposed full-length feature film called “Innocence of Muslims.” The same user uploaded an overdubbed version, apparently in Arabic, on Sept. 4. Beyond the YouTube postings, essentially nothing about Bacile’s life can be publicly verified. Details reported by news outlets Tuesday and Wednesday morning were often in conflict with one another. And on Wednesday afternoon, The Atlantic’s Jeffrey Goldberg spoke with a “self-described militant Christian activist” named Steve Klein, who served as a consultant on the film, and who told Goldberg that the name Sam Bacile itself is a fake. Later, actors involved in the project began to speak out, saying they were deceived about the nature of the film. CNN obtained a statement purported to be from the entire cast and crew, saying that, “[w]e are 100% not behind this film and were grossly misled about its intent and purpose.” One of the actresses involved with the film, Cindy Lee Garcia, gave an interview to Gawker on Wednesday in which she said that she and the other actors on the project were duped by the Bacile. According to Garcia, lines from the script were overdubbed in post-production. She told that the film was going to be a film based on how things were 2,000 years ago. It wasn’t based on anything to do with religion, it was just on how things were run in Egypt. There wasn’t anything about Prophet Muhammed or Muslims or anything. The only sparse evidence indicating that an entire version of “Innocence of Muslims” was filmed beyond its 13.5-minute trailer came in comments from an employee of the Vine Theater, a Hollywood Boulevard theater that was padlocked on Wednesday. The theater employee, who declined to identify himself, said that a version of “Innocence of Muslims” ran briefly several months ago at the theater and that a man whose first name was Sam had brought the film to the theater. The attack on the Benghazi Consulate and the death of the US Ambassador to Libya has elicited a flurry of responses from around the globe, and while most of the world is issuing the typical “shock and condolences” statement, Russia, who led the opposition to NATO intervention, is also feeling a bit vindicated. So while Russia’s official statement was also a condemnation, a number of other Russian officials and analysts chimed in with addendums, calling this the inevitable consequence of imposing regime change. Was this absurd and offensive film a 9/11-type incident to spark violent protests giving justification to the Americans to move its forces to Libya? After all Libya is an oil rich country like Iraq and Americans have enough reasons to keep this country under their thumb. It is yet to be seen if the attack on American diplomatic facility was coordinated or spontaneous, but one thing is clear, Americans are adept at earning international ire despite investing their taxpayers’ money into countries of their strategic interest.